Last month we wondered what MasterCard would bring to the table at this month`s CTIA Wireless Association conference in New Orleans. On the conference`s opening day yesterday, MasterCard announced the birth of PayPass Wallet Services, which builds on their existing PayPass technologies and is similar to Google Wallet and other mobile payment systems. PayPass Wallet will offer a single place where customers can store their credit and debit card information; this secure digital wallet will be similar to PayPal in that when making purchases online, people can use PayPass Wallet to pay rather than entering their card information each time, at each site. Anyone who shops online frequently knows how annoying it is to enter their name, address, card number, security code, and expiration date every time they virtually check out. Once a customer has PayPass Wallet set up, they won`t have to do that anymore. 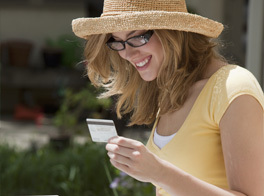 They can store information for up to 25 cards of any brand, not just MasterCard. PayPass Wallet will work at the checkout counter, in front of the computer, or on your phone. Whether shopping online, on a smartphone, or at a brick-and-mortar shop, PayPass Wallet will be able to process payments. Online or by phone, customers will enter a password, and at an in-store point of sale (POS) terminal they can also pay using a Near Field Communications (NFC)-equipped phone to access their list of available cards. They`ll simply tap the phone to the POS, the way they currently tap an NFC-enabled credit card to the register now. MasterCard plans to have PayPass Wallet up and running by the third quarter of 2012, and will simultaneously launch the product in North America, Australia, and the United Kingdom. For now, they plan to get the payment system working smoothly and implemented as many places as possible, but in the future, they hope to add services such as budgeting tools that send out spending alerts and allow users to set controls. They will also offer discounts and incentives, possibly capitalizing on the daily deals market partnership they recently announced in connection with Local Offer Network. Unlike similar digital wallet systems from Visa, Google, PayPal and others, MasterCard is opening up its platform to third-parties, letting them either use PayPass Wallet under their own brands or use MasterCard API to build their own platform. A company logo will be built into PayPass Wallet but other than that, companies can use their own branding. MasterCard will not even get paid when people use a PayPass Wallet service that`s been re-branded by someone else. So why would they do it? They may see some advantages, such as banks that use the platform giving priority to MasterCard before other companies` cards. Industry experts predict that PayPass Wallet will be used with MasterCard 80 percent of the time, even if they are branded under another name. As many experts predicted in the recent study that we reported on, it does seem that cash and even credit cards as we know them are on their way out. With more and more options for virtual and mobile payments, people might be wise to start collecting up their favorite wallets (the actual, not the virtual, kind) for future sales to antique stores.